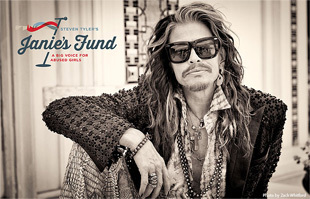 Rocker Steven Tyler has launched a safe haven for abused and troubled girls in Atlanta, Georgia. The Aerosmith star attended the ribbon cutting ceremony at Janie's House on Wednesday (December 6), and told TMZ the venture is one of his proudest achievements. "It takes young girls in and it's got a staff, and it's got some therapists, and it's got people for them to talk to," Tyler said. "When girls come in and they're broken and battered, it's a place for them to go." Janie's House, which can offer refuge and therapy for 30 girls at a time, is the first safe haven launched through Steven's Janie's Fund - and he's convinced it will be a huge success. The recovering drug addict added, "I'm also in a 12-step programme and it's about passing it on. It's about learning what's going wrong and maybe making it right for someone else. "If there's maybe a glimmer of hope for them (abused girls), that's all I care about... It makes my heart explode." Wednesday's launch party marked one of Tyler's first public appearances since he was forced to fly back to the U.S. following an Aerosmith gig in Brazil in September due to "unexpected medical issues". Steven quickly cleared up speculation about his health, which prompted his bandmates to scrap the remainder of their South American tour, insisting he simply had to have "a procedure" that only his doctor "could perform". His actress daughter Liv has since explained her father's illness is not life-threatening, adding, "It was just one of those things when he had a little thing that needed to be taken care of and he was in pain. "It’s hard when you're on tour because you don’t want to let everybody down. And then it just got bad and he had to go to L.A. to have a little operation. He is recovering."